Remembering African Singer And Style Icon Papa Wemba : The Record One of the biggest stars to emerge from contemporary Africa, the Congolese singer made a huge impact on international high fashion as well as music. Congolese singer Papa Wemba performing Saturday in Abidjan, Ivory Coast, shortly before collapsing onstage. He died before reaching the hospital early Sunday. One of Africa's most famous musicians and an international style icon, Congolese singer Papa Wemba, died suddenly during a performance early Sunday at age 66. He died after collapsing onstage in Abidjan, the economic capital of Ivory Coast; the show was being broadcast live on RTI 1, one of Ivory Coast's public television channels. Wemba's death was confirmed by the culture minister of the Democratic Republic of Congo, Baudouin Banza Mukalay, the Associated Press reported. According to reports obtained by Reuters from the Ivory Coast morgue that received Wemba's body, he died between his collapse and his arrival at a local hospital. Papa Wemba was born in 1949 in Lubefu, in the Central African nation known then as the Belgian Congo, later as Zaire and now as the Democratic Republic of the Congo (DRC). His birth name was Shungu Wembadio Pene Kikumba, but as the eldest son in his family, he was nicknamed "Papa." His mother was a professional mourner; he grew up steeped in the sounds of her music and blessed with a singularly keening tenor. But other circumstances also made Wemba's emergence as an artist particularly fortuitous. He grew up during a golden age of Congolese music. During the 1950s and 1960s, his country was the epicenter of a brilliant new kind of dance music variously called Congolese rumba, lingala and soukous. This new style borrowed heavily from the sound — and particularly rhythms — of Cuban big bands, but put in an African context. Artists like Franco and Tabu Ley Rochereau became idols all over the continent, and to the young Papa Wemba as well. By the time he arrived in Zaire's capital, Kinshasa, in the late 1960s, the young Wemba had set his sights on a professional singing career. In 1969, he became a founding member of what would become one of the biggest acts in African music in the 1970s, Zaïko Langa Langa. The band took Congolese rumba, stepped up the tempo, and brought in more rock-ified guitars. And with that band, Wemba launched a trailblazing career that emphasized an internationally accessible sound. Wemba left Zaïko Langa Langa in 1974; after co-founding a series of other short-lived bands (including Isisfi Lokole and Yoka Lokole), he founded a hugely popular group called Viva La Musica in 1977. Offstage and on, Wemba embodied a dapper persona. He even turned to acting, and starred in the 1987 Congolese vehicle La vie est belle (released internationally as Life Is Rosy), in which he, unsurprisingly, played an aspiring young singer. Papa Wemba's smooth, easy sound and extraordinary voice reached the ears of some very famous European and American artists as well. He settled in Paris in the 1980s, and became one of the best-known — and most well-connected — musicians from Africa. He sang with Stevie Wonder and opened for Peter Gabriel, before going on to record for Gabriel's Real World label. As the years went by, Papa Wemba continued to hone his sound to keep up with current trends. In the early 2000s, he strove for a silky R&B sound on tunes like "Ye Te Oh." More recent singles found him collaborating on more hip hop-flavored tracks like "O'Koningana," alongside a rising young performer named Tony Madinda. Papa Wemba also gained notoriety for his offstage dealings. When he toured Europe in the 1980s, he would arrive with huge entourages of dozens of musicians, dancers and staff from Zaire. In 2003, he was accused in both France and Belgium of running a human-smuggling ring and went to jail for several months in France; when the case went to trial in 2004, prosecutors charged that many included in those entourages were actually illegal immigrants, who paid thousands of dollars to enter Europe with the famed singer. He was convicted in France, fined and given a suspended prison sentence; foreign news organizations like London's Independent reported then that his bail was paid by the Congolese government. Upon his release, he moved back to the DRC. 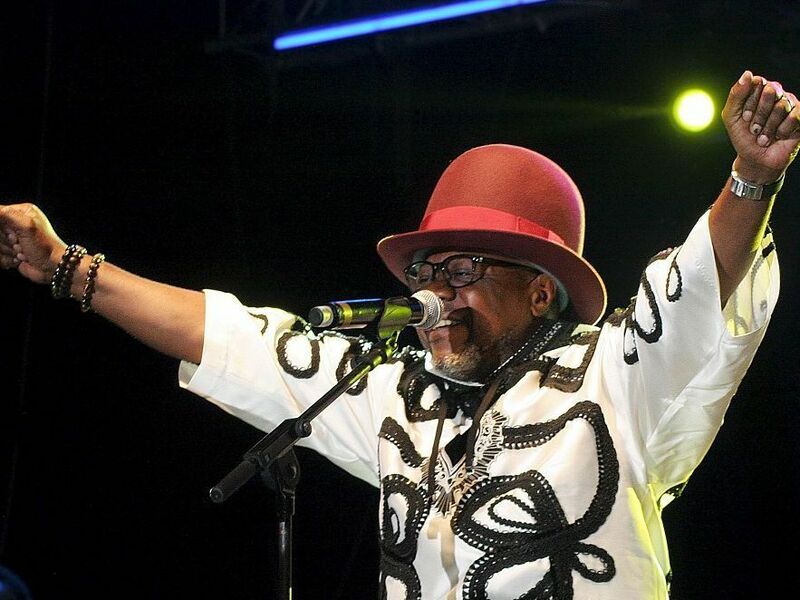 At home, and across sub-Saharan Africa and the African diaspora, Papa Wemba will be remembered not just for his voice and for his musical innovations, but his legendary sense of fashion style. As I noted just last month on Latitudes, the singer was celebrated as "Le Pape (The Pope) de la Sape" — the undisputed king of the fashionable men known as sapeurs. That sobriquet is so well known in the French-speaking world that in a popular YouTube skit about dressing well and living large, a French comedy trio refers to their characters as "Papa Wemba's hidden sons." The sapeurs' natty attire even became the inspiration for a number of international menswear designers, including Junya Watanabe and Paul Smith. "His whole attitude about dressing well was part of the narrative that we Africans have been denied our humanity for so long. "People have always had stereotypes about us, and he was saying dressing well is not just a matter of money, not just something for Westerners, but that we Africans also have elegance. It was all about defining ourselves and refusing to be stripped of our humanity." An earlier version of this post stated that Abidjan is the capital city of Ivory Coast. In 1983, the nation's political capital was moved from Abidjan to the city of Yamoussoukro.